This project can be done by people of all ages. I wanted something different that parents could keep as a real keepsake. I know preschool parents keep for years all of the "precious" things their children make. But I wanted something really special. The parents agreed this was it! 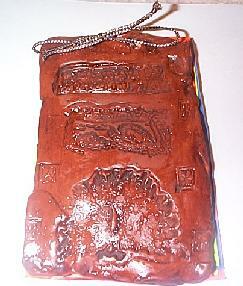 We made a polymer clay cover for a small memory book. We made two styles. 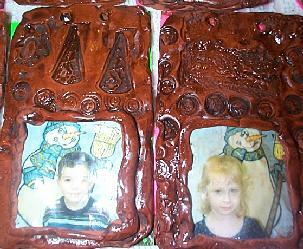 One with a picture of each child baked into the clay and the other plain. 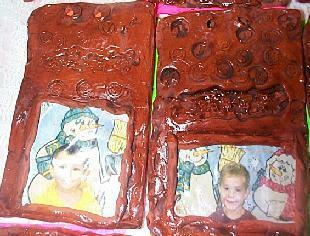 A couple of the teachers helping me while they learned to use polymer clay, did not want their own picture on the book. So we made a couple plain. 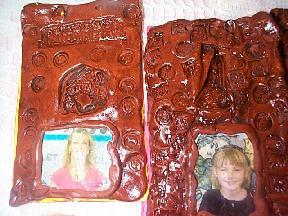 The sculpey clay started out in a terra cotta color. Because I was a visiting teacher for an after school program, I took my projects home with me to bake and finish. I have to admit I did a lot of work on this myself. I cut the pages to size and punched the holes, and threaded the books. 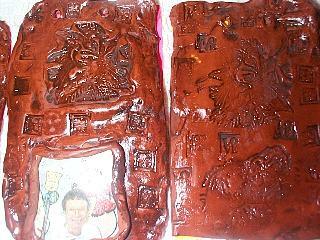 I also antiqued the clay and glazed after baking. I really do not suggest the antiquing around preschool kids unless they are fully covered with a smock etc. It is easier to paint myself. It was worth my effort! Wax paper or parchment for each child to keep clay and tables clean. Plus parchment to line glass dishes when baking. 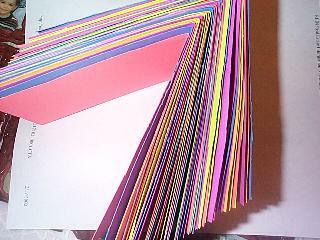 8 by 11" card stock in neon colors for the pages of the book. Neon or other colors of poster board for to glue to finish clay for inside cover. Or xerox copy in color or black and white of picture. Aluminum foil for teacher to use under drying pictures, glazing, antiquing or gluing. Projects will peel off of the aluminum foil. 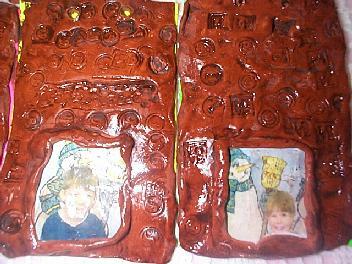 Picture Frame Book- Making the Picture. The class before take a picture of each child. OR use Digital camera and print with computer printer. Resize if needed to a smaller size picture. Cut to shape and size you want. Paint with brush a coat of Sobo glue on the top and let dry. When dry do the same for the back. Make sure to work on aluminum foil. 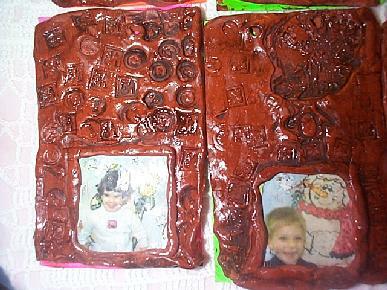 The glue dries to a nice glaze and lets you bake the picture in the oven with out the picture burning. 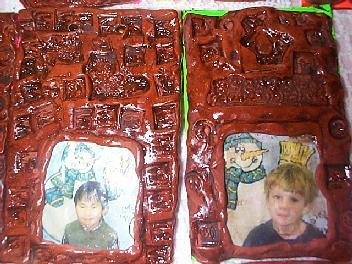 Give each child enough clay to make the size cover you want. I wanted to end up with only a small book so I used about 1/8th of the box per child. 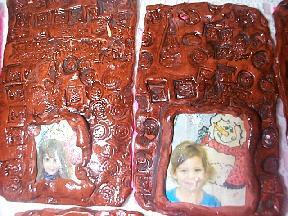 Let them play with the clay to soften and condition this gets out all air bubbles that can cause cracking in the oven. The terra cotta sculpey softens in only a few minutes. Give each child a piece of the poster board that you already cut to the size cover you want. Give each child rolling pin or something thing to roll with. Roll the clay to fit the size and shape of the poster board. They may need help with this. 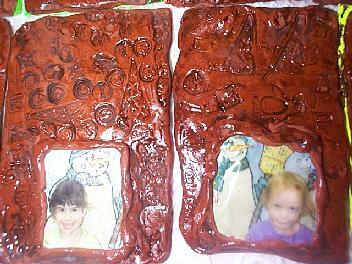 Give them a little bit of clay for them to roll into snakes to make a frame around the picture. Supervise them rubber stamping the book cover. They just need to softly stamp with NO INK onto the clay. Make sure to use the metal clay pointer or something to make two holes on the top of the book cover to use later to string the book together. I did not measure neatly and this caused more work for me later! If this is a picture book you do not need to label the clay. If this is not a picture book, put their initials or name on the clay with your pointy tool. Carefully peel the poster board off of the clay before baking. Save the poster board for later. I use my home oven and line the pryrex glass pans with parchment paper as I often use pans for other things and want to keep the chemicals off of the pans. After baking and cooling, place on aluminum foil. Paint with the antiquing paint, covering the entire piece. Wipe off imediately with a paper towel or a damp paper towel if it dried to long. 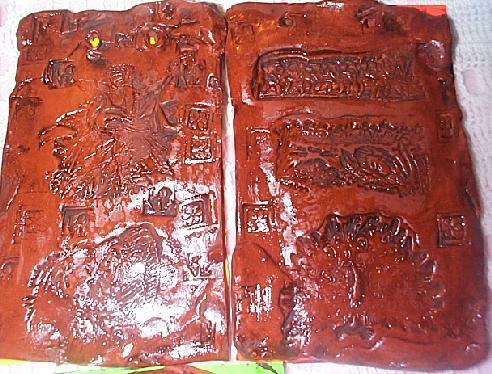 The painting gives the clay a leather or wood look. When dry paint one coat of sculpey glaze in a matte finish. When dry, turn over and glue the poster board square you used as a measuring tool. This step may not be needed but I liked the color and adding a little more strengh. I liked using a variety of colors for the inside of the book. I cut the card stock into roughly fourths for our books. Placing about 4 sheets doubled to make 8 pages under the clay, (or how many you want.) I marked with a pencil the spot where I needed to punch or poke the holes for stringing. I found my metal pointer worked better than using a hole punch through the 8 sheets. 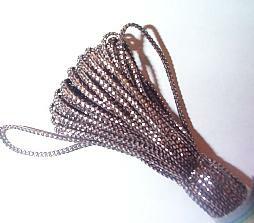 String the cord from the back to the front of the book. Use metallic marker and paint their name and the date or year they made this book. If you are working with older kids or have extra helpers you can emboss or rubber stamp the personalized page. If you don't supervise they may stamp too many pages and you really want to send home blank pages for the parents to fill. Examples of books with out pictures.